It’s hard to beat, or avoid the feeling of freedom when riding your motorcycle, whether your going to work, or out for a spin, cruising or speeding. 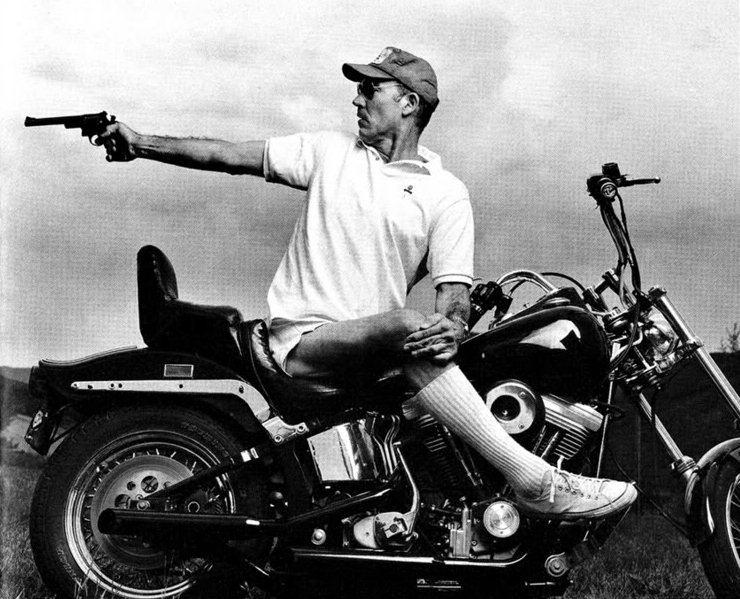 Who better to describe that feeling than Hunter S. Thompson. 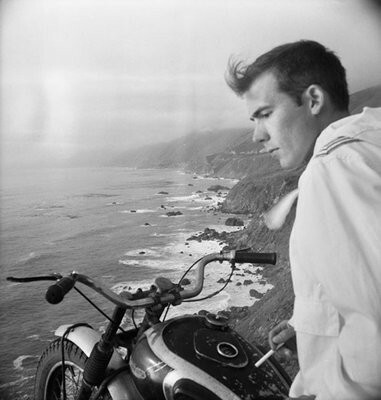 “Midnight on the Coast Highway” was written not long after he finished with the Hell’s Angels. For anyone who does not know the feeling of unleashing a motorcycle on a empty highway, this piece should go a long way to giving you an idea of what it’s like. Hunter said of this piece.. “Later on I can look back at something like that thing about “the edge” which I wrote about twenty minutes after coming back from doing it. My face was still almost frozen, dark red and crusted with tears, not from crying but tears that start coming to your eyes just from the wind. I was so high on that-from coming back-that I sat and wrote the whole thing, right through, and never changed a word of it. It’s one of my favorite pieces of writing.” Marty. Months later, when I rarely saw the Angels, I still had the legacy of the big machine – four hundred pounds of chrome and deep red noise to take out on the coast highway and cut loose at three in the morning, when all the cops were lurking over on 101. My first crash had wrecked the bike completely and it took several months to have it rebuilt. After that I decided to ride it differently: I would stop pushing my luck on curves, always wear a helmet, and try to keep within range of the nearest speed limit … my insurance policy had been cancelled and my driver’s license was hanging by a thread. So it was always at night, like a werewolf, that I would take the thing out for an honest run down the coast. I would start in Golden Gate Park, thinking only to run a few long curves to clear my head, but in a matter of minutes I’d be out at the beach with the sound of the engine in my ears, the surf booming up on the sea wall and a fine empty road stretching all the way down to Santa Cruz … not even a gas station in the whole seventy miles; the only public light along the way is an all night diner down around Rockaway Beach. Then into first gear, forgetting the cars and letting the beast wind out .. . thirty-five, forty-five … then into second and wailing through the light at Lincoln Way, not worried about green or red signals but only some other werewolf loony who might be pulling out, too slowly, to start his own run. Not many of those – and with three lanes on a wide curve, a bike coming hard has plenty of room to get around almost anything – then into third, the boomer gear, pushing seventy-five and the beginning of a windscream in the ears, a pressure on the eyeballs like diving into water off a highboard. Bent forward, far back on the seat, and a rigid grip on the handlebars as the bike starts jumping and wavering in the wind. Tail-lights far up ahead coming closer, faster, and suddenly – zaaapppp – going past and leaning down for a curve near the zoo, where the road swings out to sea. Indeed … but no sand this time, so the lever goes up into fourth, and now there is no sound except wind. Screw it all the way over, reach through the handlebars to raise the headlight beam, the needle leans down on a hundred, and wind burned eyeballs strain to see down the centerline, trying to provide a margin for the reflexes. But with the throttle screwed on there is only the barest margin, and no room at all for mistakes. It has to be done right … and thats when the strange music starts, when you stretch your luck so far that fear becomes exhilaration and vibrates along your arms. You can barely see at one hundred; the tears blow back so fast that they vaporise before they get to your ears. The only sounds are the wind and a dull roar floating back from the mufflers. You watch the white line and try to lean with it … howling though a turn to your right, then to the left and down the long hill to the Pacifica … letting off now, watching for cops, but only until the next dark stretch and another few seconds on the edge… . The Edge… . There is no honest way to explain it because the only people who really know where it is are the ones who have gone over. The others – the living – are those who pushed their control as far as they felt they could handle it, and then pulled back, or slowed down, or did whatever they had to when it came time to chose between Now or Later. But the edge is still Out there. Or maybe it’s In. The association of motorcycles with LSD is no accident of publicity. They are both a means to an end, to the place of definitions.